The 6 Marks of Progressive Christian Worship Music - Crosswind Music - book - Bryan's New Book! 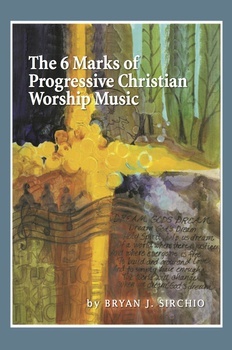 My book-- The 6 Marks of Progressive Christian Worship Music -- was released in September, 2012. You can purchase it directly from me here (that's the most profitable way for me to sell it if that matters to you!) for $15.00 plus $4.95 shipping, or you can find it (probably cheaper or even less expensive as a Kindle download) on Amazon, Barnes and Noble, etc. Click on the "Buy from 2CO" tab above to purchase the printed book here on this site. It will be shipped to you immediately via priority mail. And if you'd like me (Bryan) to sign it or dedicate to someone please email me at bsirch@sirchio.com and let me know what you'd like me to write. I'll be more than happy to do that. For those of you who may be new to me, The 6 Marks of Progressive Christian Worship Music is primarily a resource for pastors and musicians in tradtional or "mainline" churches (Presbyterian, United Church of Christ, Dicsiples of Christ, Methodist, Episcopalian, ELCA Lutheran, and some Roman Catholics) that are using "contemporary music" in their worship services. Basically, The 6 Marks of Progressive Christian Worship Music is my attempt to explain to church musicians why many of their more mainline and/or progressive pastors and church members often struggle with the language and theology of the "praise and worship" music that worship bands play. Hopefully this book will help shift the energy of the conversation that so often takes place among mainline church folks regarding "contemporary praise and worship music" from a negative place to a positive and creative place. Instead of simply complaining about what we don't like in praise and worship music, The 6 Marks of Progressive Christian Worship Music is an invitation to get clear on what kind of new music and lyrics we'd love to bring into our churches at this point in history. The 6 Marks of Progressive Christian Worship Music includes questions after each chapter to facilitate discussion among pastors, church musicians, and anyone else interested in reading the book as a group. The writing style is very conversational and easy to understand. Please be gently and playfully warned!! Some of the content of The 6 Marks... may strike you as a bit radical and controversial, especially when it comes to what is and is not emphasized in Progressive Christian Worship Music. Most folks who have read the book seem to be enjoying the way in which I explore some of these complex theological issues, but I just want you to know that some of the content may be new and challenging. I've been greatly encouraged by the responses I've received to the book so far! I've been pleasantly surprised to find that many folks who are not pastors or musicians are finding the book to be stimulating and meaningful. A number of readers have written to let me know that The 6 Marks... has given them a way to understand their own beliefs and opinions more deeply, and that it is helping them to have meaningful and respectful conversation with more conservative Christians regarding some of the issues explored in the text. At the very least, I think this book will help folks deepen their appreciation of the power of music and lyrics in the life of a worshipping community. Please contact me if you have any questions, and if you're a friend and/or fan, please tell folks about this book and help me get it "out there." Thanks! Feel free also to ask me about quantity discounts if you'd like to buy 5 or more books. I'm always eager to give folks the best value possible.